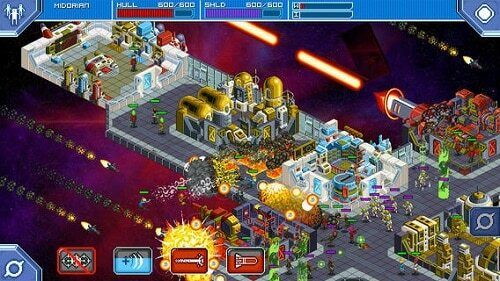 Star Command is space exploration game mixed with simulation that allows you to create your crew, explore the galaxy and battle against a range of hostile aliens. 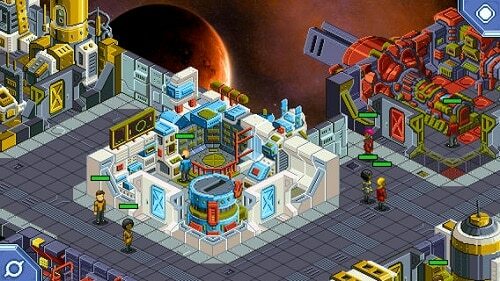 Born from a successful Kickstarter campaign in 2011 Star Command was eventually released in 2013. The game feels like something out of the Star Trek universe as you take command of your very own starship that belongs to Star Command, a humanoid organisation that protects the human race from aliens while also exploring the galaxy. You’ll have scientists, engineers and tactical officers within your ship to assign tasks, improve their skills and keep ultimately keep alive. Commanding your ship and the core combat gameplay is kept fairly simplistic which suits the mobile environment. This includes collecting various tokens to fire your weapons, completing all sorts of mini games are tapping to move your crew around the spaceship to fend off invasions. Your ship is fairly customisable in Star Command with players able to select the rooms that they want to build in the available spaces. The choice is more one about ship layout than actual choice though as the variety isn’t huge. To fill these rooms you’ll need crew members that you can hire and then assign. Rooms are split into yellow (engineering), blue (science) and red (tactical) rooms which will slowly guide your crew members into specialisations to boost their skills and efficiency. The story of Star Command is fairly well-written and does keep you engaged from start to end. The only real drawback is everything seems to end in combat without enough alternative paths to explore which make it feel more linear than intended. Unfortunately this also means you’re unlikely to give the game a second playthrough as well despite the multiple difficultly levels since you don’t gain much other than a handful of different ship designs for your second adventure. Explore the galaxy and take part in a galactic story line. Develop your crew and assign them roles on your ship. Fight against ships and alien boarders. Simple mini games for ship combat fit well on the mobile platforms. Buy for iOS or Android.